I wonder how any reader today could look at these two cards together and not see Osama Bin Laden and the Twin Towers. But I’m trying to see beyond that event, as it is history now. 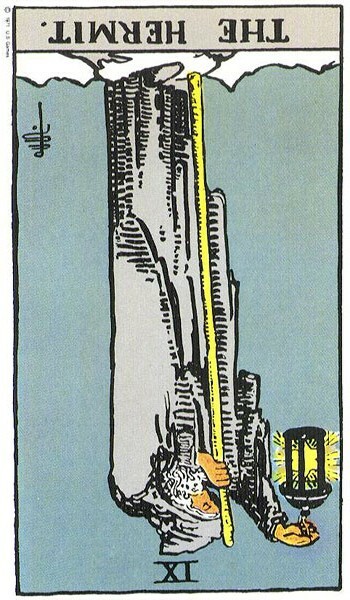 What do these cards mean to us now, today, as individuals, or to us collectively as a group (as a family, as a community, as a country, as a global community)? Isolation and solitude are tools in our repertoire for self-development, but they can be overdone, and they can be abused. Sometimes we withdraw not for meditation and reflection and prayer but simply to withdraw, because of depression or other illness, or to sulk, or to plan things that are negative and far from beneficial. I think it’s okay to withdraw during a depression, but we have to be careful about too much solitude at such times. Don’t withdraw so far that it’s hard to come out again. Okay? 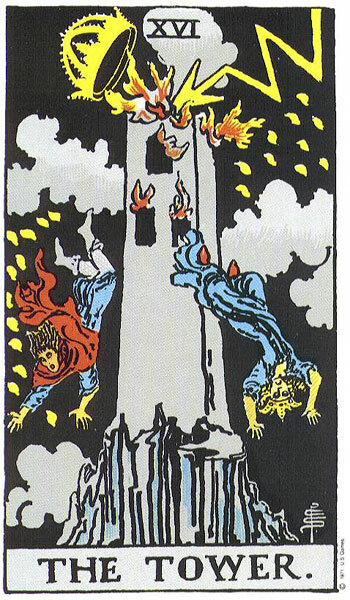 Also, don’t withdraw to avoid finding out something that is going to make itself manifest to you no matter what (The Tower). If you are headed for a rude awakening, it’s coming, no matter how much sand you might choose to bury your head in. As a country, in the U.S. (where I live), are we withdrawing from reality? Are we refusing to see the rude awakening that is heading straight for us? I’m afraid this may be so, and that it may be coming this time, not in the form of terrorism, but in the form of a worsening economic crisis and global environmental upheavals. To get through the coming times, we will have to come out and form a community — it won’t work to simply hide and huddle in our caves.